Since his first full-time NASCAR® season two years ago, 19-year-old William Byron has amassed 10 combined wins in the NASCAR Camping World Truck Series™ and NASCAR Xfinity Series™. In 2018, Byron moves up to the sport’s top series and one of the most successful teams of all time as he takes the wheel of the No. 24 Chevrolet Camaro ZL1 for Hendrick Motorsports. Liberty University, Byron’s current sponsor in the NASCAR XFINITY Series™, is making the move with Byron and will be the primary backer of Byron’s rookie ride for multiple races next season. 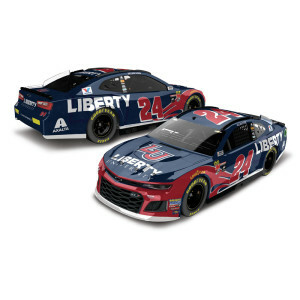 Now the die-cast of Byron’s 2018 Liberty University Chevrolet Camaro ZL1 is available to order from Lionel Racing. Not only is this replica built on the all-new Chevrolet Camaro ZL1 tool, it’s also being offered in two new trim levels. Lionel Racing has reconfigured its 1:24-scale Action Racing Collectables (ARC) tool to be a lower-priced hood-open collectible. Plus, for the first time, Lionel Racing is making a brand-new 1:24-scale ELITE die-cast available to all customers. The car is also available in a 1:64-scale. Don’t miss the rookie die-cast of this up-and-coming star. Order now!